Family will be the focus at Samford University Nov. 2-3 as the university prepares to host nearly 500 families for its annual Family Weekend. Highlights of the two-day program include campus tours, a volleyball game, tailgating on the Quad and a football game, among other events. Check in and registration begins Nov. 2 from 4-8 p.m. in the Howard Room in Beeson University Center. Families are encouraged to bring canned goods to donate for Basket of Kindness. Those who are unable to register at that time will have the opportunity to register on Nov. 3 from 9-10 a.m.
Friday night's events include a Samford volleyball game against Southern Conference rival Elon at 7 p.m. and a performance by the Alabama Symphony Orchestra SuperPops in Broadway Romance with Ted Sperling in the Leslie S. Wright Center at 8 p.m. Families can also attend a social gathering in Harry's Coffeehouse, which will feature ice cream floats and Samford students performing some of their favorite songs. On Saturday, an open house featuring student organizations and academic units will be available to families. Beginning at 11:30 a.m. families can eat lunch and tailgate with the rest of the student body and other fans on the Quad before watching the Bulldogs take on Wofford in an important Southern Conference football game. A photo booth will be available at various times throughout the weekend in Ben Brown Plaza for families who want to capture some fun family photos. 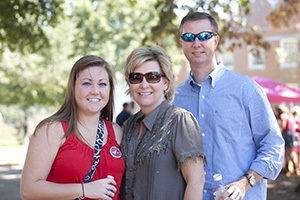 Families are encouraged to register online for Family Weekend. Online registration is available until Oct. 31. Once the deadline has passed, families can still sign up by in person by going to the Howard Room when registration opens on Nov. 2. For additional information please contact parents program director Kelia Furr at kfurr@samford.edu or 205-726-4230. Drew Laing is a senior journalism and mass communication major and a writer in the Office of Marketing and Communication.